Log A pirate spirit who stayed at Keelhaul Key to guard his treasure. That's Cortez! 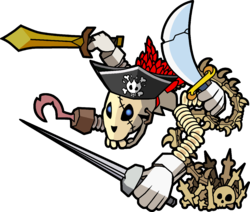 He's the dreaded pirate spirit who haunts the island! Max HP is 20, Attack is 4, and Defense is 1. His HP may seem low, but he's a spirit, so even when his HP hits 0, he'll come back. Plus, he has tons of different attacks. He's as tough and scary as he looks. I'd say just keep damaging him, and sooner or later he'll go down for good! Let's give this tormented spirit some eternal rest! Cortez is the holder of the fifth Crystal Star, the Sapphire Star, in Paper Mario: The Thousand-Year Door. During dialogues, he appropriately speaks in a Spanish accent. 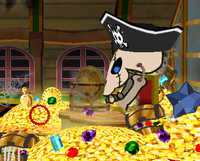 He resides on the Black Skull, a pirate-ship-like vessel, deep within Pirate's Grotto on Keelhaul Key. Cortez's name is presumably a reference to Hernán Cortés, a Spanish conquistador most well-known for embarking upon an expedition that led to the downfall of the Aztec empire. Cortez tries to scare Mario and his partners away (in the same vein as Tutankoopa in the first game) when he thinks the plumber is after his treasure; when his eerie messages fail, he drops the act in disgust and begins a battle. After his defeat, Cortez seemingly prepares to vanish, only to reveal that his state of unlife renders him effectively invincible. However, Mario is finally able to explain that he wasn't interested in Cortez's treasure, only in the Crystal Star. Somewhat bemused and asking why Mario "didn't just say so" in the first place, Cortez willingly hands over the artifact, offhandedly remarking that he never particularly cared for the Crystal Star anyhow. When Four-Eyes revealed his true identity as Lord Crump, Mario and Flavio return to Cortez, in order to request the use of his ship. Cortez was not particularly interested, spouting that he didn't want the Black Skull to be used as a luxury liner. He also tells them that even if he wanted to lend them his ship, the ship is useless, as it won't operate, because of the loss of its power source, the Skull Gem. Flavio then reveals he has the gem, causing Cortez to be even more furious, and not wishing to help them even further, as Flavio's ancestors stole it from him. He eventually relents after Flavio reminded him that Mario defeated him once, and hints he'll have Mario fight Cortez again for the ship. He also says that if Cortez doesn't help, he'll throw the Skull Gem into the water where Cortez will never find it. Cortez relents, and proceeds to help Mario in battle against the X-Naut attack on Keelhaul Key. From then on, Cortez stays docked at Rogueport, and would ferry Mario to Keelhaul Key and back whenever he wanted. Cortez in his basic form. The Sapphire Star is visible on the right. In battle, Cortez has three forms. His first form appears as a massive skeleton with four arms and no legs, his spine emerging from a spiky pile of bones on the ground. Cortez wields a different bladed weapon in each hand - a bronze sword, a cutlass, a rapier, and a rusty hook that can cause poison. Between his ensemble of weapons, Cortex can attack either one or both heroes every turn. Once this first form is defeated, Cortez transforms into a serpentine state, trading his arms and weapons for an enlarged rib cage concealing a green gem. This form attacks with a headbutt, and can charge before throwing a bone at either character, dealing great damage in the process. Attacking the pile of bones will cause Cortez to lower his upper half, and doing so twice will cause him to open his rib cage, exposing the green gem. This gem has -1 defense (attacks deal 1 more damage than usual). After his second form is defeated, Cortez abandons a body and returns to a simple floating head. Although he is limited to a simple bite attack, he compensates by animating his weapons from the first state, effectively giving Mario and his partner five opponents to worry about. The weapons have different properties to their attacks, and are immune to frontal attacks due to their pointed tips; however, they can be destroyed simultaneously by a moderately strong attack that hits all opponents. If Cortez takes heavy damage, he can also absorb the souls of the Audience to restore his HP, similar to Hooktail and the Shadow Queen. The only difference is that Cortez can only absorb souls equal to half the current audience members, and the remainder will remain to support Mario; by contrast, the Shadow Queen will absorb the entire audience, and Hooktail scares away the uneaten members. With good planning, it is possible to defeat Cortez with a swift assault before he gets a chance to absorb the audience. According to Grifty, Cortez is the one who defeated the Stalwart Koopa and caused him to be sealed in a magic Black chest. Cortez then took possession of the Sapphire Star. At the end of the game Goombella says Admiral Bobbery, Cortez, and a few others went to sail the world. That's Cortez, remember? The dread pirate ghost feared by all? Ring a bell? Boy, hard to imagine someone that scary would like us... But he's just a big sweetie! Plus, he's like our taxi service between Rogueport and Keelhaul Key! I love him! Spanish Cortés Same as in English and Japanese; a Spanish surname. Despite having only 20 HP, Cortez's recovery move will recover up to 100 HP, depending on how many audience members are present. Cortez's artwork does not show his true form; instead, it shows one of his battle forms. If Cortez's Rapier misses the character in front (due to a Lucky), the character in the back will automatically perform a Guard. This page was last edited on October 21, 2018, at 20:23.